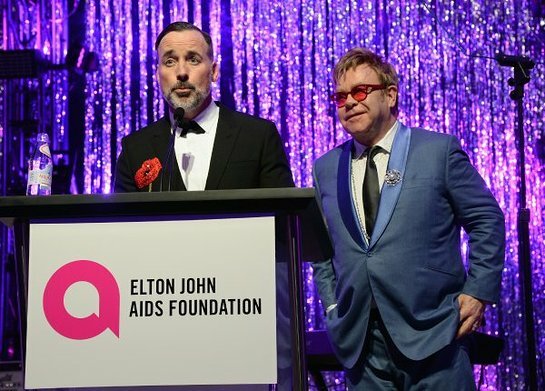 The 23rd annual Elton John AIDS Foundation Academy Awards Viewing Party hosted by Sir Elton John and David Furnish raised $5.8 million for the fight against HIV/AIDS. The gala, which took place on Sunday, February 22, at West Hollywood Park in Los Angeles, was sponsored by Chopard, Neuro Drinks, and Wells Fargo; American Airlines serves as the Foundation’s official airline. Attendees included Sir Elton John & David Furnish, Heidi Klum, Miley Cyrus, Alec Baldwin, Robert Duvall, Tim Allen, Aaron Paul, John Stamos, Chris Colfer, Beck, Lil' Kim, Ryan Kwanten, Cloris Leachman, Judith Light, Rob Low, Moby, Lydia Hearst, Ozzy, Jack, Kelly & Sharon Osbourne, Petra Nemcova, Cody Simpson, Gigi Hadid, Dita Von Teese, Brittany Snow, Lisa Rinna & Harry Hamlin, Alessandra Ambrosio, Camilla Belle, Nina Dobrev, Sandra Lee, Jane Seymour, Sia, Russell Simmons, Bellamy Young, Sarah Hyland, The Band Perry, Julianne Hough, Maggie Grace, Peter Fonda, JC Chavez, Dermot Mulroney, Jonathan Groff, Chris Hardwick, Jared Harris, Eric McCormack, Giovani Ribisi, and Bryshere Y. Gray, among others. Guests arrived at the Academy Awards Viewing Party for cocktails followed by a gala dinner and viewing of the 87th Academy Awards telecast. For a third consecutive year, Chef Gordon Ramsay, British celebrity chef, television personality, restaurateur, and holder of 14 Michelin stars, prepared an exquisite 5-course meal for guests. The dinner was followed by a lively auction. Auction items included the Alex Prager photograph Sheryl: 2009; the Jeurgen Teller photograph of Joan Didion for the Celine Campaign Spring Summer 2015; the Stephen Somerstein print Dr. Martin Luther King, Jr. Speaking to 25,000 Civil Rights Marchers at End of Selma To Montgomery, Alabama March. In Front of Alabama State House. March 25, 1965 – View of Rear of Head with Crowd of Marchers in Background; a Greg Gorman photograph and portrait sitting; an all-inclusive, four-night stay for four people at the Clayoquot Wilderness Resort; a five-day stay for four people at Steven Tyler's Hawaiian Retreat; and two tickets to the Vanity Fair Oscar Party later that night. Following the auction, Grammy winner Nile Rodgers & CHIC took the stage to perform several songs, including such favorites as “Le Freak,” “We Are Family,” “Dance, Dance, Dance (Yowsa, Yowsa, Yowsa),” “Everybody Dance,” and “Good Times.” Nile will be releasing the first CHIC single in 23 years on March 20th. The title of the song is “I’ll Be There.” The new CHIC album, It’s About Time, will be released summer of 2015. Both single and album are coming out on Warner Brothers Records. In his remarks for the evening, EJAF Founder Sir Elton John thanked his guests for enthusiastically participating in the evening’s audience participation feature, which enabled guests to make gifts to the Foundation on the spot using their cell phones. Throughout the evening video messages from long-time EJAF supporters Neil Patrick Harris and Matt Lauer, as well as live messages from EJAF friends Alec Baldwin and Mike Myers, encouraged guests to text in pledges to support the Foundation’s urgent mission.